Nephrite jade, ruby, gold and possibly emerald, fashioned carved and polished using abrasives and abrasive-charged tools. 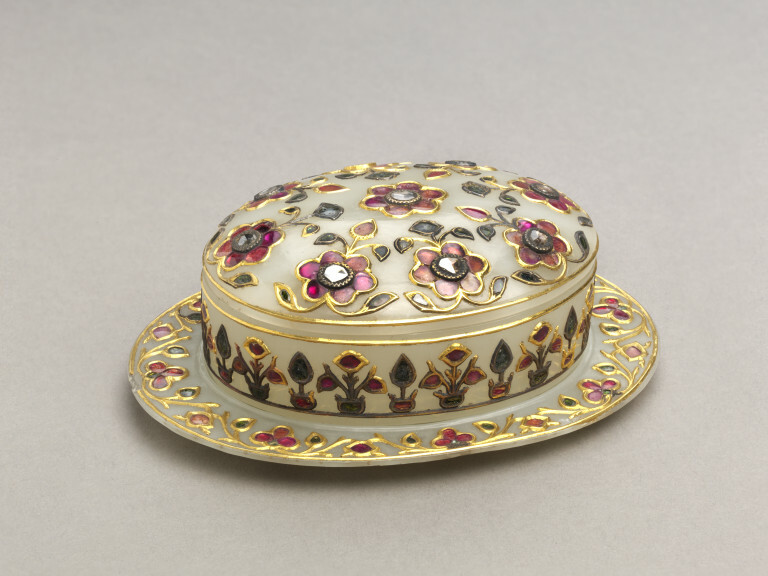 This box, cover and stand clearly illustrate the skills of the craftsmen who were producing fine objects using techniques from the time of the Mughal Empire. Each has been expertly fashioned from a single piece of nephrite jade, which is a hard and durable material that requires patience and skill to work. This is especially true when the process requires hollowing out cavities to form containers or other receptacles. The pieces have then been carved, and inset with gems and gold. Additionally, although nephrite is a hard material, when it has been worked to give fine edges or thicknesses, it can be prone to damage by sharp impacts or significant and rapid changes in temperature. Objects such as this would have been destined only for wealthy or powerful people. An oval box, cover and stand, fashioned in white nephrite jade and polished all over. Inset with ruby cabochons, diamonds, probably pale emeralds and gold. The stones have been mounted in reflective, closed-back, coloured settings but most of the colouring has since deteriorated. The box is shallow with a smooth interior and underside. The exterior walls have been inset with gold, 48 pale rubies and 24 greenish stones which are probably pale emeralds or possibly aquamarines, in a design of flowers and plants in shallow pots or vases. These all reside between two thin gold bands that too have been set into the walls. The rim has a raised inner ring around it to locate and secure the cover onto the box. The stand is shallow, with an uneven, recessed centre to seat the box and to hold it in place. The recess is surrounded by a band of inset gold, 32 pale rubies and 24 greenish stones (probably pale emeralds or possibly aquamarines), with an thin outer band of gold wire around the rim. The base is smooth with a raised rim and with four shallow, drilled and threaded holes. 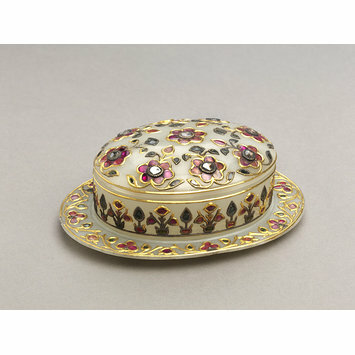 The cover is gently domed, with a smooth interior and the upper, exterior surface has been inset with gold, 58 pale rubies, 9 diamonds and 36 greenish stones (probably pale emeralds or possibly aquamarines), arranged in a floral design and residing within an outer border of fine gold wire. There are a few cracks of natural origin to all parts but particularly the cover. These appear to be stable and they should not affect the stability of the objects. There is also a chip out of one end of the stand with a short length of the gold border missing. This box, cover and stand were fashioned in India and were acquired by Arthur Wells who was a Nottingham solicitor and Clerk of the Peace. He was a keen traveller and was made a Fellow of the Geographical Society. He is considered to be the first private British collector of Chinese jade and his collection of jade and other hardstone objects from South Asia was on exhibition at the South Kensington Museum at the time of his death in 1882. This collection was left to the museum in his will - the Wells Bequest.